Mumbai, September 16, 2016: WestCoast Group, a fully integrated aquaculture company has won the ‘Community Development’ award at the prestigious Asia Pacific HRM Congress Awards, for the role it played in the support and development of shrimp farmers in Surat and Navsari districts of Gujarat. 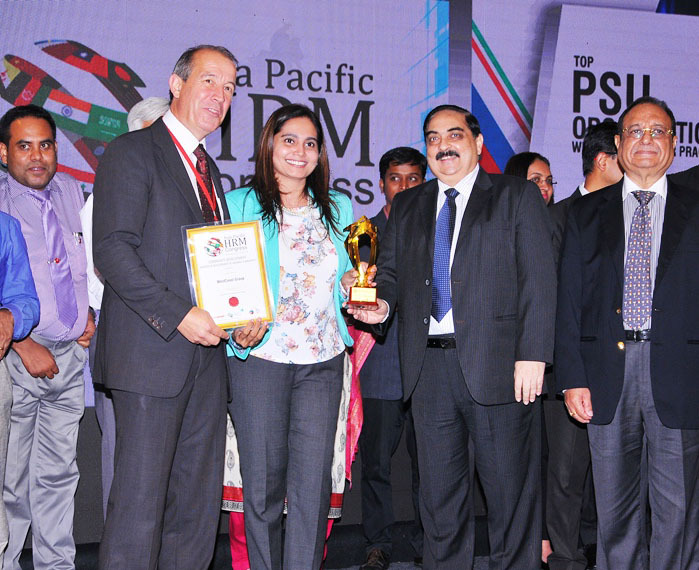 The award was received by the Executive Director of the company Ms Shweta Vakil, at a glittering function in Bengaluru recently. In the late 1990s and early 2000s, when the Indian shrimp farmers faced tremendous restriction in getting bank financing, WestCoast, under the able leadership of its Chairman & Managing Director Shri Kamlesh Gupta played a pivotal role in supporting the farmers by extending credit for setting up their farms. Till today, along with credit support, the farmers are also being trained on Good Aquaculture Practices, through on-field training, farmer meetings and seminars. All the support has been consistently ensuring a great improvement in farming methods and a good quality end produce. The company also helped in the financial inclusion of farmers such as opening of bank accounts, securing PAN cards and filing of regular tax returns. It has been in constant dialogue with the bankers and government authorities for making easy bank loans and insurance available for the shrimp farmers. WestCoast today supports more than 1,000 people in Gujarat aquaculture farmer families. This form of farming model created by WestCoast is popularly known as the ‘Gujarat-Surat’ model of aqua farming or ‘Venture Capital’ farming. “This award is a recognition to our belief in inclusive growth. We came to the scene, when no bank was ready to finance the shrimp farmers, a sector considered to be largely unorganised and affected with seasonal vagaries. Our journey with our farmers has been a win-win, where our farmers have prospered with our support and we were able to gain top export quality shrimps on time. ‘We can grow only if our farmer grows’, has been our motto, throughout this journey,” said WestCoast CMD Shri Kamlesh Gupta. Asia Pacific HRM Congress award is judged by an independent jury comprising senior and accomplished human resources and CSR professionals from the industry. WestCoast was adjudged for the award for bringing value to the parameters such as community development, corporate social responsibility, farmer empowerment, poverty alleviation, social innovation, and social entrepreneurship. Mumbai-based WestCoast group is among the largest exporters of shrimp from India and a leading domestic retailer of seafood and other frozen products. It is the country’s first and only fully integrated aquaculture enterprise operating in the west coast of India and Gulf of Cambay in the Gujarat State. The group is engaged in the business of shrimp hatcheries, shrimp farms, and processing & freezing of seafood. It is also engaged in trading and distribution of Shrimp feed and other aquaculture inputs, marketing, retail and distribution of indigenous and imported frozen food products, E-commerce, supply to hotels, restaurants & caterers. WestCoast exports “Cambay Tiger” shrimps to more than 30 countries including United States and major European and South-East Asian countries. Close to 7,000 tons of Cambay Tiger shrimps are exported annually. The company has also ventured into a path breaking project which is Fish Cage culture and has a vision to produce 10,000 tons of the Best Quality Fish per year within the next three years.